ac·cede [ak s?d] (past and past participle ac·ced·ed, present participle ac·ced·ing, 3rd person present singular ac·cedes) intransitive verb 1. assent: to give consent or agreement to something 2. come to power: to attain an important and powerful position 3. sign treaty: to become a party to an international agreement or treaty [15th century. 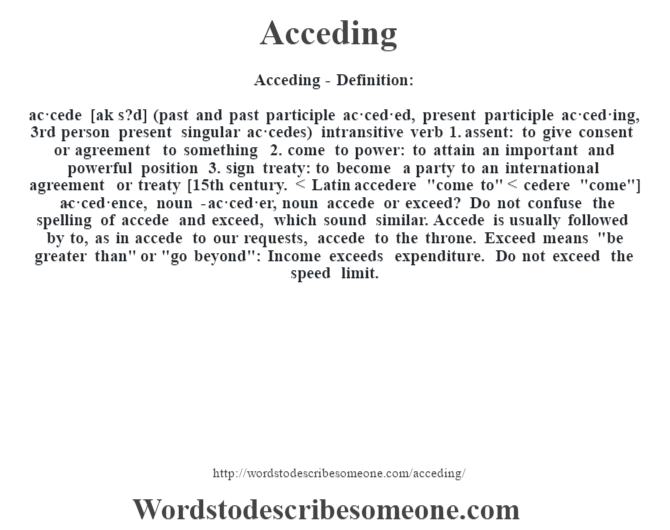 < Latin accedere "come to" < cedere "come"] -ac·ced·ence, noun -ac·ced·er, noun accede or exceed? Do not confuse the spelling of accede and exceed, which sound similar. Accede is usually followed by to, as in accede to our requests, accede to the throne. Exceed means "be greater than" or "go beyond": Income exceeds expenditure. Do not exceed the speed limit.